So much can change in a year. So much inevitably does. We grow, we learn, we try new things, we shed old skin and step into new. Sometimes a year makes us stronger, sometimes it feels like it has blindsided us a bit and we’re still struggling to regain our footing. Without regard or even respect for how we’re feeling, time barrels on. The years fly by. The best we can do in order not to get overwhelmed by the pace and impermanence of life is to experience each day, live it, breathe it, see it. Even if the day holds pain or anxiety or fear, if we get inside that feeling and let it become part of who we are rather than an outside force dominating us, then at least we are living rather than letting life pass us by. It must be because I haven’t blogged or baked in over a month that I’m feeling philosophical today. It might also have something to do with being in Kenya, so far away from the familiar sights, sounds, and distractions that accompany my life in the States. Here my brain seems to expand to allow the room to take in more, reflect more, experience life in a way that is more vivid than when I’m surrounded by the familiarity of San Francisco life. It’s not because my life here is less chaotic. In fact, life in Kenya can more often than not be described exactly as such. It’s just that my mind seems to perk up a little more at being in a foreign place, even if it’s one I’ve spent a substantial amount of time in before. So I have learned to let it wander, perambulate, explicate, and philosophize. If nothing else, it’s entertaining to see where the mind will roam when we give it the freedom to do so. This post really has nothing to do with baking, as it turns out. Given that baking and life lessons are to me one and the same, I’ll take the poetic license to let this one slide. 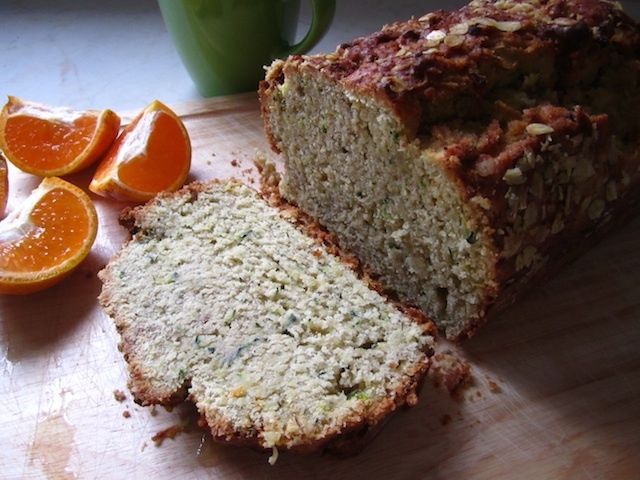 This orange zucchini bread is delicious, baked with in-season, local produce. I’ll consider this a fulfilling preview of what the coming weeks of baking in Kenya hold. Preheat oven to 350° F / 176° C. Grease and lightly flour one loaf pan. With an electric mixer (or a fork and elbow grease), beat eggs in a large bowl until light-colored and foamy. Add oil and sugar. Beat at least 3 minutes on medium-high speed of mixer/elbow until very light and lemon-colored. Add vanilla, zucchini, orange zest, and orange juice. Mix lightly but thoroughly. Into a bowl, sift or stir together flour, salt, baking soda, baking powder, cinnamon, and nutmeg. Gradually stir flour mixture into egg mixture, mixing lightly but thoroughly. Pour into loaf pan. Bake on center rack 45-55 minutes or until tooth pick or knife inserted in center comes out clean (depending on the size of your loaf pan, you may need to bake it on the longer side. I baked mine for closer to 60 minutes). Cool in pan for 10 minutes. Turn out of pan and cool completely on a drying rack before wrapping in foil and storing in the refrigerator (or eat some/all of it while it’s still oven-warm!). This entry was posted in Not pie and tagged bread, orange, zucchini. Bookmark the permalink.